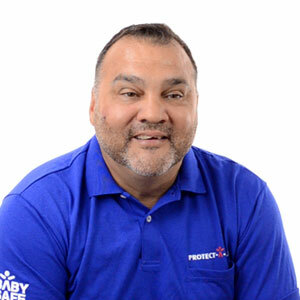 Protect-A-Child has been keeping Miami children & pets safe around the water for over 30 years. Safely secure your pets from access to the pool, ocean, patio, garage or yard. Get peace of mind about your child's safety around the pool or seawall. The perfect pool fence add-on for hours of fun in your swimming pool. We Provide Miami Families with a Safe & Stylish Solution for Securing the Pool, Seawall and Patio. Protect-A-Child of Miami is dedicated to giving parents and grandparents in South Florida peace of mind about the safety of their little ones around the pool as well as safety by the seawall. In addition to safety, we know that aesthetics are very important to homeowners, just as they are important to us. That’s why Protect-A-Child continues to innovate their mesh pool fence to exceed expectations for both safety and style. Check out our pool fence photos and to see for yourself! Once a customer signs off on their pool safety fence project estimate, we go to work detailing the exact position of each fence post on the patio. Most pools have curves, angles and/or sharp corners, so it is rare that we can simply drill each hole vertically into the patio surface. To assure a straight fence we calibrate each hole to ensure the fence installation results in the most taut, transparent, and attractive fence. The surface we are drilling into makes a big difference as well. The Miami market offers many forms of decks and patio surfaces, from concrete and pavers to marble floors. Therefore, evaluating the quality and foundation of the deck will ensure a long-lasting, quality installation. We use top-of-the-line diamond-tipped core bits for our wet drilling core drills in order to keep fence post holes precise and clean, leaving minimal impact on your patio surface. After the holes have been drilled and your fence is safely in place, we will be sure the area is cleaned up as if we were never there. We will also show you how to properly operate, remove and replace your pool fence. We pride ourselves on our customer service and communication throughout the process, so there are no surprises. And, our services does not end once we pack up our tools and leave. As your local Miami Protect-A-Child dealer, we’re always a quick phone call away if you have any questions or need us to stop by to help. This is one of the major reasons we continue to get such great reviews from pool fence customers.